By now, Lea Campbell is no stranger to death threats. As the head of the Mississippi Rising Coalition, she’s been receiving regular threats from white supremacist groups, including the KuKluxKlan for more than a year. Campbell founding the Mississippi Rising Coalition in 2016 with the goal of helping Mississippi rise from the bottom to the top of the list of quality of life metrics. According to their website, they do this by, “empowering individuals and communities through community organizing, education, coalition-building, and advocacy in the areas of human and civil rights and social justice, and by increasing citizen engagement in the democratic processes” of the state. 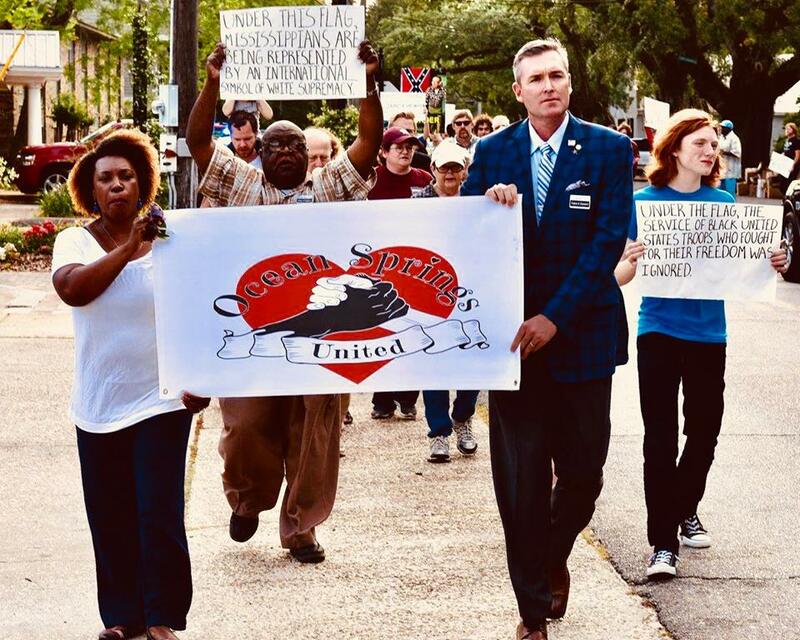 In 2017, the nonprofit began helping the residents of Ocean Springs, MS organize to protest the city’s new Mayor and Board of Aldermen’s decision to display the Mississippi state flag on municipal properties for the first time in 12 years. 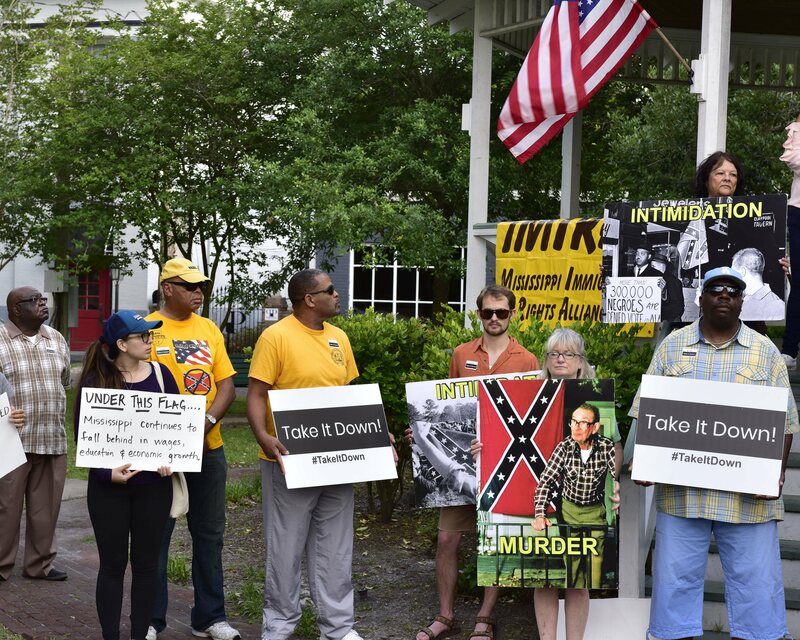 When the mayor responded by raising his voice to Clark, members of Mississippi Rising called for a boycott of the city. For nine months, the Mississippi Rising Coalition helped to organize marches and protests. They encouraged citizens to attend Board of Aldermen meetings. But officials largely dismissed and ignored the will of the people. Lea and the Mississippi Rising Coalition kept pushing, helping and encouraging residents to continue to be vocal about their wishes. Finally, in 2017, Mayor Shea Dobson ordered the flag removed, saying that it had become a distraction. Unfortunately, that wasn’t the end of it. During the next Board of Aldermen meeting, a resolution was passed mandating that the flag be displayed on all city properties. It was a coordinated strategy between the BoA and the mayor to give him political cover. 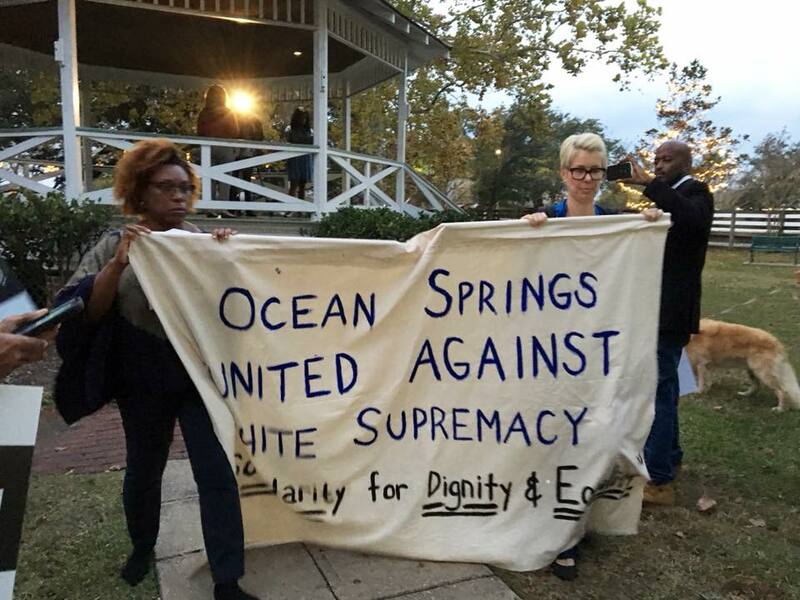 The residents of Ocean Springs, with the help of the Mississippi Rising Coalition and other groups, continued to organize and protest, speaking out against the actions of the BoA and mayor, and gaining national attention. 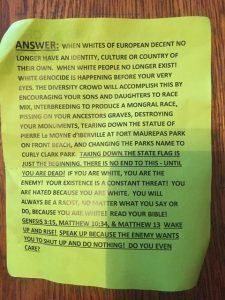 White supremacy fliers began appearing around the town, on the streets, sidewalks, and in residential yards. Two videos, apparently created and sent by the Klan, arrived. But Lea and the other members of the Coalition refused to give up. They filed suit against Ocean Springs for violations of the Fair Housing Act. The case when all the way to the 5th Circuit Court of Appeals. There, the group suffered a blow when the court ruled that they lacked the standing within the FHA to obtain a judgment against the city. Rather than remove the flag, which contains a clear symbol that represents white supremacy and oppression to many, the city instead tried to get the court to sanction Mississippi Rising and require the group to pay the city’s court costs. Although they were frustrated, Lea and the Coalition pressed on. 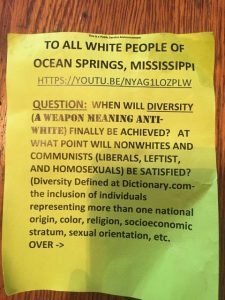 They’ve moved to organize on a statewide level, pushing to have the Confederate symbol removed from the Mississippi flag. Mississippi is the only state flag that still contains the Confederate emblem. For many, this symbol serves a reminder of slavery, segregation, and systemic oppression. None of Mississippi’s public universities will fly the flag, and several cities and counties have stopped flying it as well. As their work has continued, so have the threats. On Thursday, the latest anonymous envelope arrived – this time threatening the group’s children. Lea Campbell refuses to be intimidated. She took to social media, calling out the writer.